Visiting Arches National Park, Utah. An almost surreal place in the centre of the United States is home to one of the most fascinating national parks we have ever had the privilege of visiting. Mars combined with cascading canyons and rock features are what comes to mind when I think of this place. Deep hues of orange and red, paint the landscapes only to be broken up with bright blue skies and scatterings of cactus and the occasional palm. This exciting and intoxicating park is so full of natural beauty it’s hard to believe that it’s real. Along with crazy rock placements, deserted plains and canyons, the national park is home to some 2000 catalogued arches. It is a space where nature certainly proves both her power and beauty. Thousands of years worth of rain, wind and weather extremes were the ultimate crafter in the building of these natural sculptures. From metre high arches that provide the perfect cubby house for youngsters, to archways towering in excess of 50 metres, the endless sizes and shapes will keep you fascinated for hours on end. With 119 square miles, it’s easy to see you would need a few days to cover the entire park. However, don’t let this stop you from going if you only have a couple of hours to spare. You can certainly visit a number of the most popular attractions and still experience the magic of the incredible natural features Arches has on offer. Some of the most popular sites such as Balanced Rock and Court House Towers are only a quick 5-minute walk from the car park. On the other hand, some of the harder to reach places that hikers love can be anywhere from a 2 – 4hr round trip, such as Delicate Arch. So whether your a hiking addict with a week to explore or a pro photographer with a couple of hours spare, this place is sure to amaze everyone. Located in the NE of Utah, and 5 miles from the town of Moab. From Moab – Drive 5 miles north on Main St / US 191. The park entrance is on the right after the second set of traffic lights. From Interstate 70 – Take exit 182 Cresent Junction. Drive south for 28 miles on US 191. The entrance to the park will be on your left. Take water! There are two water stations in the park located at the visitor centre and entrance to Devils Garden. In the summer the temperature can be extremely hot. So if you plan on being here in the summer months, make sure you go early in the morning or late afternoon. On the other hand, if you’re visiting arches national park in the winter the temperature can drop well into the freezing levels and you may even see snow blanket the entire park. Best practices are to take some waterproof hiking boots and lots of layers to keep you toasty. 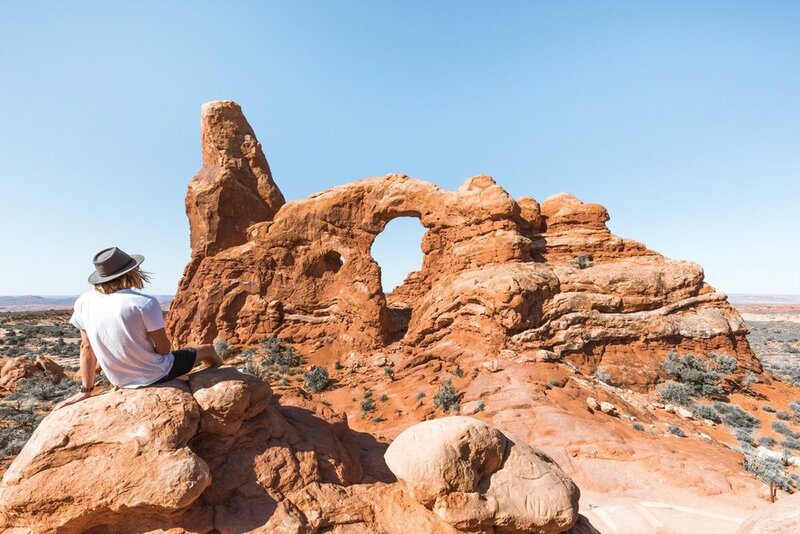 We’d recommend allowing two days minimum to explore the Arches National Park in depth, however, in one day you can also accomplish a lot of the major points of interest if that's more your thing. Accommodation options are abundant near the Great Arches National Park. Whether you prefer to sleep under the stars or would like a comfy bed and warm shower, it is advised however to book well in advance if you can. Below are some options to make it a little easier for you. Have Fun! There are plenty of paid camping sites to choose from which offer you basic amenities such as a toilet block and showers. Many of these camping sites come under The Bureau of Land Management (BML) and cost about $15USD a night. Note, however, many of these campsites are first in best dressed. So if you want to nab one of these guys it’s suggested to go early take your site ticket and then head off on your adventures for the day. That way you won’t be hurrying around with the setting sun trying to find a vacant spot in the dark. Free Camping- In the USA, people are allowed to camp and stay overnight freely on Public Lands. These spots can sometimes be tricky to find, but if you’re a camper on a budget this is the way to go. As this is free land, there is no power, showers, toilets etc. It’s just you and the land. But it makes for a fun night under the stars. So light up a campfire and enjoy the simplicity that is. Please take all waste and rubbish with you when you leave, let’s keep these spots beautiful. Hotels/Motels- Maybe not the fanciest 5-star resort you’ve seen, but if you want a bed and a warm shower this is your best option. Most of these are in the nearby town of Moab, which means you also have access to restaurants and shops so you can feed yourself as you please, or easily stock up on necessities. Subscribe to our newsletter and get our free Lightroom presets! Thanks so much for signing up! We've just sent your free Lightroom presets to your email address.